The Kala fellowship residency show is currently up in the new space. 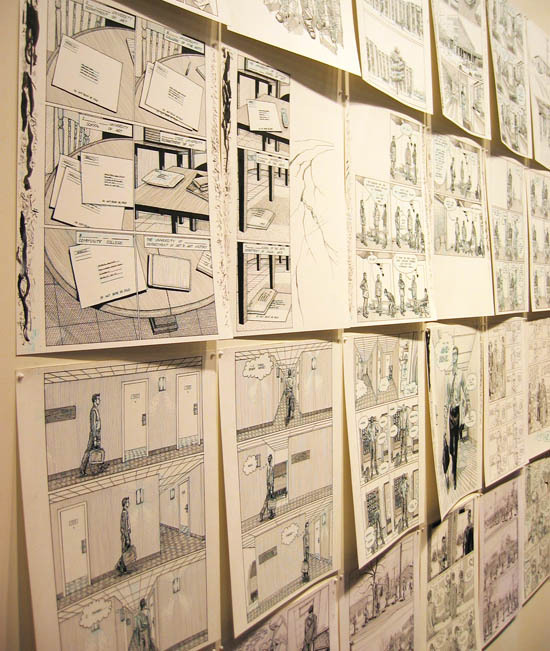 Here is a closer view of Chris Turbuck’s graphic novel in its un-bound form. Chris has become such a fixture in the workshop over these past 6 months, I don’t know what it will be like without him and his elaborate tupperware-contained lunches. Also, I cannot help myself… May I please point out a small claim to fame: Chris used me as the model for the woman getting ready for the interview in the back of this frame. Recognize anyone? This entry was posted in Events, Kala Art Institute, Openings on July 18, 2009 by ellenheck.